Integrity's iWORSHIP series is a new dimension in worship. 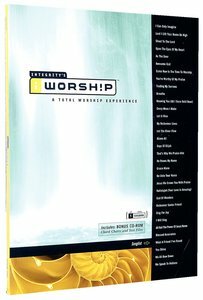 The best-selling Volume 1 double CD features well-known worship artists with 33 powerful worship songs like 'I Can Only Imagine', 'Shout to the Lord' and 'Above All'. This companion songbook includes arrangements for vocals and piano for all of the songs, plus a CD-ROM with chord charts and lyric text files. About "Iworship Songbook Volume 1"